We’ve had a different champion every night this week – although I gotta admit I’d love to see my fellow Brooklynite repeat tonight. Will he do it? Addison barely pulled into contention on that last clue; Jean’s quiet Double Jeopardy! knocked her out of contention. More interesting is the late Daily Double Chris faced with three clues still on the board. I discuss that in the video. …and no more than 4,600. For Jean, I’d wager at most 5,099, since Addison should have no more than 800 if he’s wrong with a proper wager. A tough clue, and good wagering all around. Chris found the last Daily Double under an $800 clue. Remaining were $1200, $1600, and $2000 in the same category. 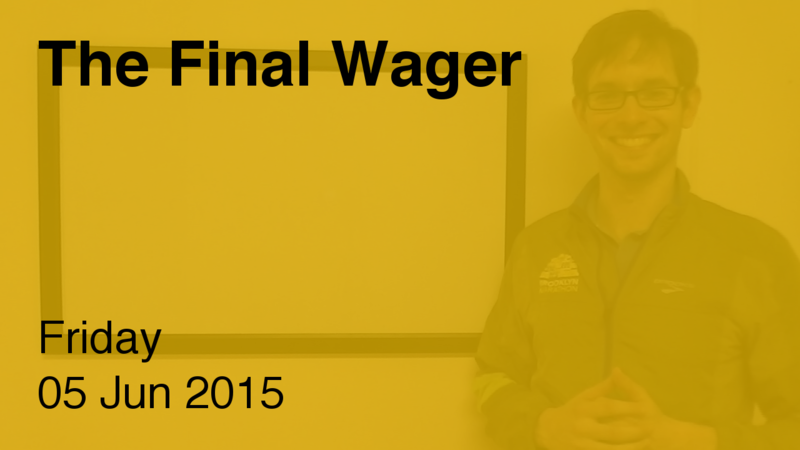 Chris made a good wager, $3,000 – it forces Addison to get one right to have a shot. Keep in mind that Chris gets the next pick – so if he’s right, he can go for the $1200 clue. A $5,001 wager would force Addison to get a higher-level clue, which we might not even see with the right amount of… uh… hmm… thinking. What is “Art for art’s sake”?